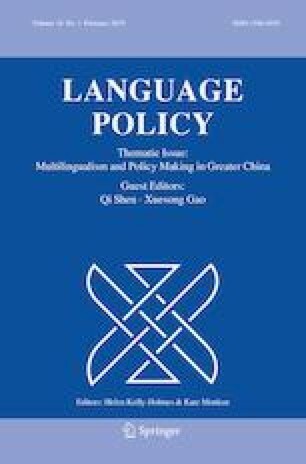 This article explores the extent to which the medium of instruction (MOI) policy in Hong Kong affect ethnic minority students’ Chinese language learning in school amidst postcolonial policy changes, and how the “flexible” MOI policy affects Chinese as a second language (CSL) frontline teaching in mainstream secondary schools with reference to the three orientations to language planning, namely language-as-problem, language-as-right, and language-as-resource (Ruiz 1984). It reports on a large-scale longitudinal study on the implementation of the “flexible” MOI policy, which is targeted to address the challenges that ethnic minority students and Chinese language teachers are faced with in CSL learning and teaching. Twenty-six CSL teachers and twenty students were target-sampled from fourteen schools involved in the same study. Based on an analysis of interview data through triangulation and critical discourse analysis, the authors argue that (1) difficulties in adapting to the new MOI for the Chinese Language subject would likely lead to low motivation levels and adversely affect CSL development among the students; (2) CSL teachers also experience difficulties in helping ethnic minority students to make successful transition for reasons including huge learning differences, limited time and resources, as well as marked linguistic differences between the two Chinese language variants. The authors recommend that policy reviews be carried out to enhance the quality of CSL teaching and learning in the midst of the current attempt at language standardization. The authors would like to thank the Standing Committee on Language Education and Research (SCOLAR) of the Hong Kong Special Administrative Region (HKSAR) for their project sponsorship, as well as the schools, teachers and students who participated in this study. Their appreciation also extends to Dr. M.S.K. Shum, Dr. W. W. Ki, Mr. K. W. Sun and Mr. F.K.L. Tang for assisting in the focus group interviews, and Mr. Nixon Leung, Ms. Jenny Zeng, Ms. Sophia Liu, Mr. Kato Chan, Ms. Karen Jiaxin Song and Mr. Jerry Siu-paak Leung for their research assistance. How many years have you spent on teaching Chinese as a first language AND/OR as a second language? What medium of instruction do you use in your Chinese language classes for EM students? Which public examination(s) do your students take for the CL subject? Did your EM students encounter any common difficulties and challenges in learning Chinese? If yes, could you please tell us more? Did you encounter any difficulties and challenges in teaching Chinese to EM students? If yes, could you please tell us more? What did you do to resolve the issues resulted from such difficulties and challenges? Are such difficulties and challenges anything to do with the change of medium of instruction for Chinese lessons during the primary-secondary transition? Could you give us one or two examples? Did you get any help or support from your colleagues and schools? If yes, how did they try to help you? Was that effective? Any suggestions for overcoming the difficulties and challenges you AND your EM students are currently facing? Could you tell me your name, class, and class number? Were you born in Hong Kong? What is your ethnicity? What languages do you speak at home? How many years have you spent on learning Chinese? What was the MOI for Chinese lessons in your primary school? What is the MOI of Chinese lessons in your current school? Did you encounter any difficulties in learning Chinese? Were they anything to do with the change of MOI for Chinese lessons after promoting to secondary school? Could you tell us more by giving us one or two examples? Did you get any help or support from your teachers and schools? If yes, how did they try to help you? Was that effective? Did you get any help or support from your family regarding your Chinese learning? If yes, how did they try to help you? Was that effective? Which public examination(s) are you going to take OR have already taken? Bureau, E. (2017). General information on DSS. http://www.edb.gov.hk/en/edu-system/primary-secondary/applicable-to-primary-secondary/direct-subsidy-scheme/index/info-sch.html. Accessed 20 March 2018. Hong Kong Unison. (2015). Research on ethnic minority parental choice in primary school selection in Hong Kong. http://www.unison.org.hk/DocumentDownload/Researches/R201506%20Research%20Report_Parental%20Choice_ENG_final.pdf. Accessed 30 June 2017. Loh, E. K. Y. (2016). Picture storybooks in teaching Chinese as a second language. CLCWeb: Comparative Literature and Culture, 18(2). https://doi.org/10.7771/1481-4374.2856. Loh, E. K. Y., Liao, X., & Leung, S. O. (in press). Acquisition of orthographic knowledge: Developmental difference among learners with Chinese as a second language (CSL). System. https://doi.org/10.1016/j.system.2018.03.018.